This is a site detailing my restoration of my Bristol 29, hull #165, built in 1971. There was a total of 169 B29's built at the original Bristol Yachts yard, in the giant barn on Popasquash Road, in Bristol, Rhode Island. Bristol was started by Clint Pearson, after leaving Pearson Yachts in 1964. The newly-formed Bristol Yacht Company asked Carl Alberg to design the B27, a very successful boat, originally built for Bristol by Pearson. They next commissioned local marine architect Halsey Herreshoff to design a larger model, the 29. Halsey is the on and off mayor of Bristol with roots in the village that date back to the yacht building empire of his grandfather Captain Nat Herreshoff, He is a gifted marine architect (although I take exception with some of the design aspects of the B29). There is no doubt the 29 sails with the grace and sensitivity, having much greater speed than her waterline length would indicate. I found #165 at Brewer's in Essex, Connecticut in 1987 and had her trucked down to Florida. 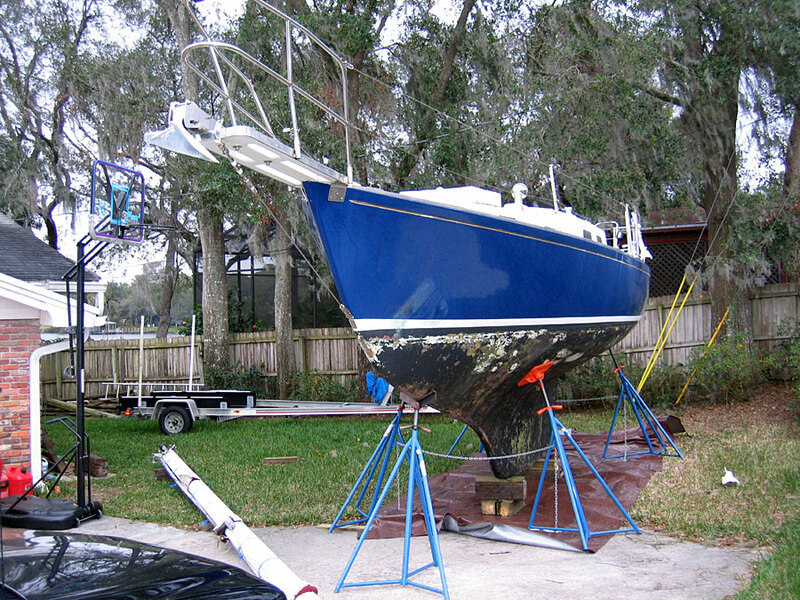 Over the past 21 years I have added and changed a lot about the boat. Bristol's in the 1960's were inexpensive, factory made boats. 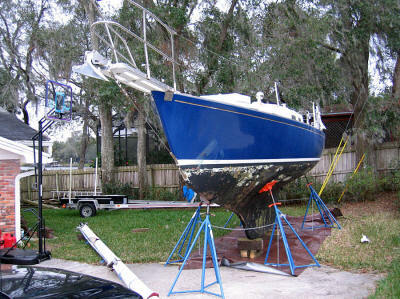 You could have a new 29 with sails for about 15K. But they were fairly Spartan for cruising, sporting cheap aluminum South Coast winches, roller reefing mains--the rage in 1971--gasoline engines (mine had a Volvo MD2B diesel), pressurized alcohol stoves, no hot water, no shower; and no refrigeration. Instead of storing her on the hard at a boatyard, I decided to bring her home. After locating a trucking firm with a hydraulic trailer, she was hauled in St. Pete and brought to my home near Orlando. I'll tell you, the convenience of having her right outside the garage door, instead of a two hour drive away, is downright amazing.